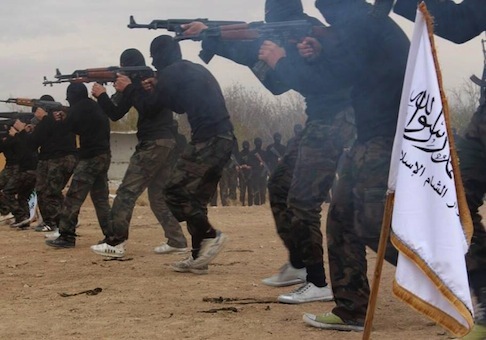 Syrian rebels are claiming that Turkey tipped off members of the al Qaeda affiliate that kidnapped at least five U.S-backed Syrian opposition fighters late last month when they entered Syria after completing a Pentagon training program. Rebels familiar with the events said they believe the arrival plans were leaked because Turkish officials were worried that while the group’s intended target was the Islamic State, the U.S.-trained Syrians would form a vanguard for attacking Islamist fighters that Turkey is close to, including Nusra and another major Islamist force, Ahrar al Sham. The Pentagon program, which has cost $41 million in training and equipment, has resulted in only 54 moderate Syrian insurgents receiving training and being vetted by the United States since its inception. While an anonymous Turkish Foreign Ministry refused to comment on the rebels’ claims, other unnamed Turkish officials indicated they were likely true. One southern Turkey official even hypothesized that Turkish intelligence leaked the information to al Nusra regarding the U.S.-trained fighters entering Syria to deal a blow to the Pentagon program and prompt America to more rapidly train and arm Syrian rebels fighting the Bashar al-Assad regime. An anonymous officer of Division 30, a rebel group with whom the U.S.-trained Syrian fighters were supposed to partner, explained that "only the Americans and the Turks knew" about the entrance of the newly-trained fighters into Syria at the end of July. "We have sources who tell us the Turks warned Nusra that they would be targeted by this group," he explained. "Right now the only thing keeping our men alive is that Turkey does not want them executed—al Qaeda always executes Arabs who work for the CIA," the unnamed officer added. A spokesman for the Kurdish People’s Protection Units, Mustafa Abdi, also alleged that he had been informed Turkey leaked the information to al Nusra. "They want the Americans to train and equip rebels but only on their terms and to confront both the regime and the Islamic State," Abdi explained. "This incident not only embarrassed the Americans and made the Free Syrian Army programs look weak compared to Nusra, but also makes working with Turkey on their terms even more important." The United States considers the al Nusra group to be a rebranded version of al Qaeda, a designation on which Turkey has pushed back. The reports regarding Turkish involvement in the kidnapping come less than a month after the United States and Turkey crafted a plan to create an Islamic State-free "safe zone" along the Syrian-Turkish border, a project that would heavily rely on Syrian opposition fighters. This entry was posted in National Security and tagged Al Qaeda, Al-Nusra, Bashar al-Assad, Free Syrian Army, Syria, Terrorism, Turkey. Bookmark the permalink.